So this is the original liquorice cake. It was such a nightmare to make. Really. You’ve no idea. It was … Anyway, it did taste good – in the end. I’m not too sure how correct this is but I decided to post it because… the voices are telling me to… Happy Halloween everyone!!! O.K. so… I think the cake part of the recipe is correct. It’s crazy and difficult to follow, it uses Blackjacks, you know those chewy, sour, aniseed-flavoured sweets, and a particular brand (don’t remember – I’m sorry…) of cinnamon-liquorice tea that I used to buy in Dunnes Stores and haven’t seen in a while – but there isn’t a Dunnes nearby here… So yes I think the cake bit is correct but … um … not sure many people will be able to follow it. The cake is made with ordinary wheaten white flour and I’m not going to try and replicate this with gluten-free flour. You have no idea how much of a headache this cake was. I had five goes at making a liquorice cake. Five. And all but the last one were really awful. And it was only as I was writing up the recipe and typed “I know it shouldn’t be so difficult to make a liquorice cake, just use a bit of aniseed essence. The only thing is I have no idea where I could buy that… ” I then searched online, being pretty sure that I could report that it wasn’t possible for me to buy it online – but of course it was. I spent the next minute staring into space, blinking. I had been laughing away to myself as I wrote up the post and then I was just like … Oh… my …. good…. AAAAAGGGHHHHHHHHHH!!!!!! DAMN IT TO HELL!!! … So … I’m not going back there. Well, I kinda have, I’ve something cooling in the kitchen, but I’m just going with that one attempt and that’s it. It’s quite different to this and I don’t think it will be as liquoricy unfortunately. Did I use aniseed essence? No, I didn’t think of doing that. There be demons in the kitchen of liquorice…. 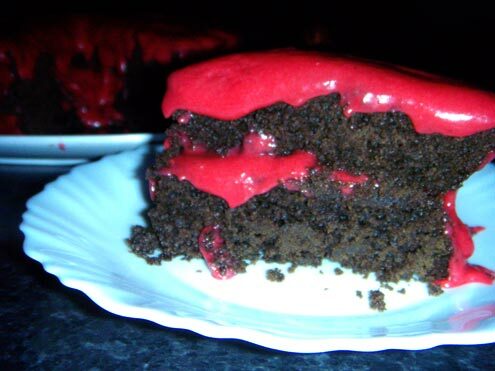 But all I really wanted to say here is that the cake bit is, I think, correct, but the raspberry ganache thing – I have no idea how I made that, it was going badly wrong so I just kept adding stuff to it. It actually ended up tasting exactly how I wanted – really tangy raspberry flavour – the whole cake tasted how I wanted it to – but I’ve no clue how I made the ganache but I have a link to the raspberry buttercream that I was trying to follow that day. Forget all the above, the ganache bit of the recipe is correct. I know. I’m as surprised as you. Um … not able to correct this one but reposting … that actually does look quite scary. But I did like it. And it’s making me repost it – eek! I knew exactly what I wanted – a liquorice cake with tangy raspberry icing. A couple of years ago I started writing a children’s book and then halfway through I realised whatever it was I was writing it wasn’t really for kids nor was it for adults – it was something I found fun but I wasn’t sure who else would enjoy it. Anyway at one point one of the characters asks for a slice of liquorice cake with tangy raspberry icing (here’s an excerpt) and ever since then I’ve been thinking I’d really love to try that. 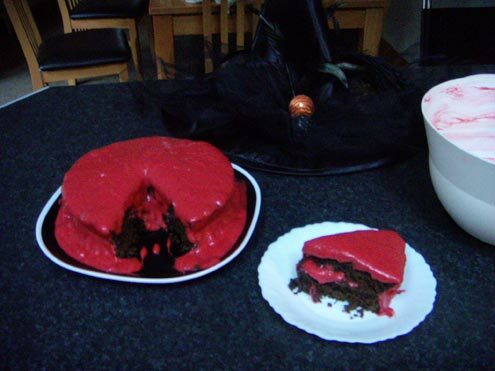 Oh yeah, the raspberry butter cream went a bit wrong and I ended up with a bloody red mess of a raspberry ganache sort of thing – which I think works very well for Halloween but if you would like something a bit more presentable try this recipe for raspberry buttercream frosting. I think you’ll need to use about twice the quantities for this recipe. I did start off by trying to make that recipe. Where did I go wrong? Um, what did I do right really? Not much. I used a whisk instead of a paddle attachment as the recipe calls for and it seems that actually that does matter, particularly if you’re trying to mix in something as bitter as the raspberries with the butter. Basically when I whisked the raspberries into the butter it all separated. I should also say that I don’t think I reduced the raspberry sauce anything like as much as I should have. I also added about 150g of icing sugar to it and about 2 tablespoons of fresh lemon juice. I searched for how to fix buttercream frosting and found a site that said if you melt a third of your mixture and then add this back into your mixture. This worked fine until I started whisking – that site did say to use a paddle attachment. That’s how I’m pretty sure that whisking your buttercream is not the best idea. So instead I melted the whole mixture over a very gentle heat (takes about 2 minutes, no time at all). I removed it from the heat and kept stirring it to cool it down and keep it smooth. It tasted great but it was very liquid. I should have let it cool down completely but at that stage I just wanted the cake made. I had already spent long enough trying to get the liquorice cake right. It was hard enough trying to find a recipe. Any recipes I could find online for liquorice cake seemed to be for some medicinal concoctions from the 19th century. Maybe the search algorithm was being adjusted that day. Eventually I decided to use a gingerbread recipe and just add things to it. I used Nigella Lawson’s sticky gingerbread recipe which is great. Serving suggestion see left: topped with natural yoghurt, freshly grated nutmeg and rashers. 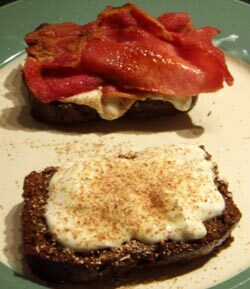 (You know, I bet Gordon Ramsay’s Spiced Breakfast Loaf would also be great with natural yoghurt and rashers.) Anyway my first couple of goes at adapting that recipe to taste liquoricy were terrible. I was using a Pastis and the results tasted like mouthwash. Mouthwash flavoured sponge is one of my worst taste experiences to date (that didn’t make me sick – and yet I still decided to start a food blog…). Finally, after I think five tries, I’ve got something which tastes good. I know it shouldn’t be so difficult to make a liquorice cake, just use a bit of aniseed essence. The only thing is I have no idea where I could buy that. Obviously I could have bought some online but that only just occurred to me now as write this. Oh well, my work around works well and I think this cake has a mild enough liquorice taste that very few people would object to it. What I did was melt down two and half packets of blackjacks in liquorice & cinnamon herbal tea. I used about 25 of them. Blackjacks are chewy sour sweets flavoured with aniseed, you could also use aniseed balls if you can’t get blackjacks. In a measuring jug add the 6 liquorice teabags to 150ml of boiling hot water. Leave for 10 minutes to infuse. Wring out the teabags into the measuring jug, then pour the liquid into the smallest saucepan you have and place over a gently heat. Add the sweets one or two at a time and stir around until they have melted. When all the sweets have melted, take off the heat and leave to cool for 15 minutes or until completely cooled. With a hand whisk, blend in the yoghurt. Then whisk in the eggs and the baking soda. Turn on the oven and preheat the oven to 170°C/gas mark 3. Whisk in a spoonful of the dark butter-sugar-spice mix into the egg-yoghurt-liquorice mix. Whisk in another couple of spoonful one at a time. By this time the egg mix should be warm enough that it won't curdle if you add it to the warm dark mix. You really don't want the dark mix to be that warm at this stage. Add the two mixes together and whisk till blended. Put the raspberries in a small sauce pan and cook over medium heat stirring with a spoon until they break down into a sauce. Pour the sauce through a metal sieve to take out the seeds and then put the seedless sauce back in the pot and simmer until it reduces to half its volume. Blend in 150g of the icing sugar and the lemon juice. Allow to cool. Beat 100g of icing sugar and the vanilla extract into the butter. Add in the raspberry mix. If it separates don't worry. Add the whole mix to the saucepan reduce the heat the lowest setting and stir constantly. Add more icing sugar according to taste. Remove from the heat and keep stirring to ensure it stays smooth. Allow to cool. If it doesn't separate, feel smug, well done you. When the cakes have baked, take out of the oven and allow to cool completely. When cool remove from the tins. Plaster one with the frosting or ganache, then add the other layer of cake and again plaster with the frosting or ganache. I doubt 250g icing sugar is right – I’d say it’s more like 500g. No 250g seems to be about right. One tablespoon of lemon is probably plenty though. Probably. Taste it and see. Seriously, I remember this as being tasty. The cake had the flavour of liquorice and the raspberry fondant had a very tangy raspberry flavour. And that’s how you get one tasty bloody mess of a cake. Scary.